I have some “barking news” here! Two of my favorite Hamptons organizations are getting together in what sounds like a doggone good time! Bay Street Theatre is partnering with ARF (Animal Rescue Fund of the Hamptons for the “Travels with Charley” Dog Walk on Saturday, May 4th at 8:30 am! Today show host and dog advocate Jill Rappaport will be there as host. The walk will start at Haven’s Beach in Sag Harbor and finish at Bay Street Theatre. There will be a “Bagels and Bones” reception immediately after the walk. I’ll be there because Bella and Russell love bagels! The walk is obviously a fundraiser that will cover 5k or a little over 3 miles with a $25 entrance fee. There will also be a GRAND PRIZE to the person who raises the most money! Now, just know I will website and ARF’s website. be the one who raises the most. YOU GOT A BONE TO PICK WITH THAT?! If your interested in hanging with Bella, Russell, Jill Rappaport and me you can get more info from Bay Street theatre on their website. Now it’s a good time to paws and get the latest news on Hamptons real estate as Douglas Elliman released it’s latest “Elliman Report: Hamptons Sales 1Q 2013.” As you’ve been hearing the market has been brisk the past few months and the new market report confirms it. 2013 started at a rapid pace tail end of the year. 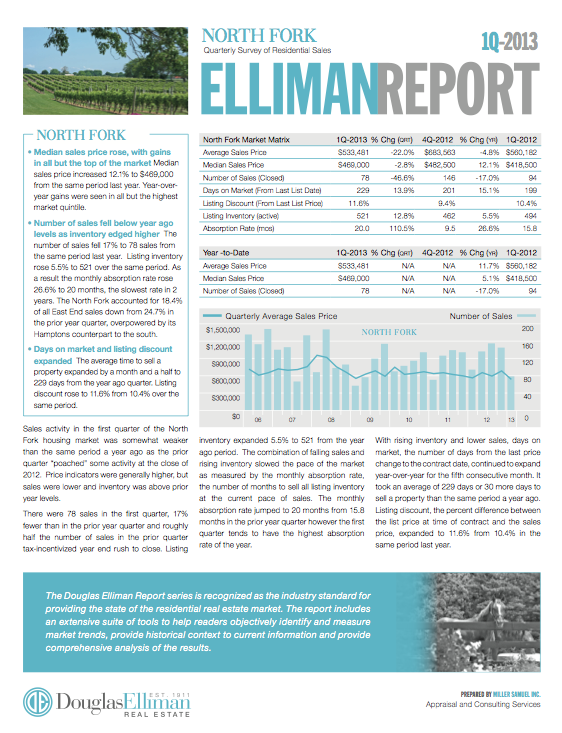 If you want more details you can download a copy of the report from Douglas Elliman. Finally, some have a bone to pick with the Hamptons and the fact it’s just gotten too darn expensive out here! Recently I had a chance to sit down with my friend author Stephen Gaines and LTV host and Southampton Press editor Dawn Watson about the state of the Hamptons economy. Take a look and in the meantime, I’ll stop hounding you with my horrible puns!